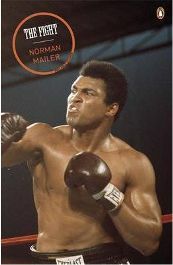 The Fight is the late writer Norman Mailer’s acclaimed book about the 1974 World Heavyweight Championship bout between champion George Foreman and challenger Muhammad Ali in Kinshasa, Zaire. Mailer was there to expertly cover The Rumble in the Jungle and infiltrated both camps (Ali in particular was a friend of Mailer) to get an inside picture of the famous encounter. The book is his account of the build-up and fight, the personalities, the entourages, the intrigue, ‘Bantu’ philosophy and the extraordinary experience of being in Africa for such a spectacular and unique event. My paperback copy of The Fight runs to nearly 240 pages and this is a must for anyone interested in boxing or Muhammad Ali. The quality of Mailer’s writing probably makes it a book that can be admired too by people not hugely interested in boxing but, obviously, an interest in the sport is an advantage because Mailer was a huge boxing fan who could write an entire chapter about the subtext of a lazy sparring session. The book begins in Deer Lake, Ali’s famous training camp. Ali is a bit down and not quite himself and Mailer picks up on this. He spends time considering Ali’s performance in sparring and his choice of sparring partners. He explains how Ali is using the sparring partners, who include future heavyweight champion Larry Holmes, to refine intricate techniques that seem obtuse or invisible to those who haven’t learnt to read him. Mailer paints a picture of lethargy but Ali perks up when he hears the odds for the fight. Foreman is a heavy favourite. He’s just destroyed Joe Frazier and Ken Norton (‘One whole horrendous nightmare’ is Mailer’s description of Foreman v Norton) and is considered unstoppable. While Ali had life and death struggles with Frazier and Norton that always went the distance, neither lasted more than a couple of rounds with Foreman. The new champion is now regarded to be an even more daunting version of Sonny Liston, the hulking former champion demystified by a young Ali in the sixties. But Ali is nearly 33 now and starting to be written off as a force in the heavyweight division. No one believes he can beat Foreman. In fact, a lot of people think Ali could be seriously hurt in this fight. The non-conformist Ali is delighted to hear that no one thinks he can win though. To Ali this is now the very reason why he will win. ‘The funk of terror was being compressed into psychic bricks. What a wall of ego Ali’s will had erected over the years.’ It’s a great opening to the book with countless lines that demand to be quoted. Mailer sets up the titanic event with this chapter. He’s older now and facing a mission that most think is beyond him but the Prince is back to reclaim his throne. One of the great strengths of the book is that Mailer really makes you feel like you are there with him in Africa, pottering about the hotel bumping into famous faces, jogging on dusty roads and attending press conferences full of intrigue with journalists hanging onto every word uttered by Don King or Ali and Foreman and their colourful entourages. Although he was mocked sometimes for his (not inconsiderable) ego, Mailer always struck me as a funny character with a real sense of mischief and if you read boxing books that dwell on the sixties especially, he often crops up as an eccentric journalist writing amazing pieces and doing silly things like try to promote a Liston v Patterson rematch on the tongue in cheek notion that metaphysically their first fight (which Liston won in about 60 seconds) was in reality a draw or something. Mailer was known for talking about himself too much in his books and here he tackles this accusation head on and turns it into a sort of joke. ‘Now, our man of wisdom had a vice. He wrote about himself. Not only would he describe the events he saw but his own small effect on events. This irritated critics. They spoke of ego trips and the unattractive dimensions of narcissism. Such criticisms did not hurt too much. He had already had a love affair with himself, and it used up a good deal of love.’ Mailer refers to himself as ‘Norman’ a lot in the book and it’s quite amusing at times. He was not always the most politically correct author that ever lived and his style sometimes teeters on the brink of being too showy but he always manages too pull back in time and win you over. His description of the end of the fight is quite remarkable in places, George Foreman somehow drawing comparison with a butler who has just heard some tragic news! There are many incidents and events in the book that Mailer conveys in his usual memorable fashion. Like, for example, him going to great lengths to arrange to join one of Ali’s 3 in the morning training runs. Mailer though, instead of getting some sleep, can’t resist staying up and stupidly going to a casino beforehand where he indulges in steak, fish chowder, ice cream and numerous drinks. He just about makes it to his date with Ali and begins jogging with him and Ali’s bodyguard in the still, dark African night as the contents of his stomach start repeating on him (Mailer describes his queasiness in some detail!). They jog through a forest and Mailer sticks at it as long as he can before he has to drop out in the middle of nowhere, leaving Ali and his bodyguard to finish the run without him. Alone in the dark he is startled when he hears a lion roar nearby. Later, Ali laughs a lot when Mailer is told that they in fact jogged near a local Zoo! There is a lot of stuff like this in the book as the fight draws nearer with Mailer milling about and trying to get the inside track on the camps. There is a top table of books that anyone who is interested in boxing has to buy, things like Dark Trade, McIlvanney on Boxing, Muhammad Ali: His Life and Times, and The Fight certainly sits at this table. This is an inventive and memorable piece of writing deserving of its fame and status. No Comments on "The Fight"